Meet our 2013 RMWQAA Analyst of the Year Steve Mustain! Steve is the Chief Chemist at the Littleton/Englewood WWTP. He was nominated by Phil Russell, Environmental Services Manager. 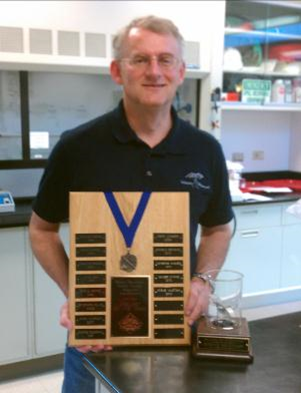 Steve was promoted last year to Chief Chemist after 10 years as an Analytical Chemist. He has transitioned very well into the new role and received great feedback from the other Analytical Chemists in the lab as well as the rest of the facility. Steve has maintained his high level of professionalism while learning and practicing new managerial skills with exceptional understanding and application. Steve spends most of his spare time on the golf course. He is passionate about the sport. He has a new canine friend named Murphy, a border collie mix who helps Steve wind down after work and his golfing trips. Congratulations to Steve for winning Analyst of the Year and for the promotion!